What’s better than enjoying an icy cold beer? Enjoying it at a favorite establishment’s beer garden. Sitting outside, enjoying the weather and a lunch, dinner or appetizer, surrounded by friends—does it get any better? 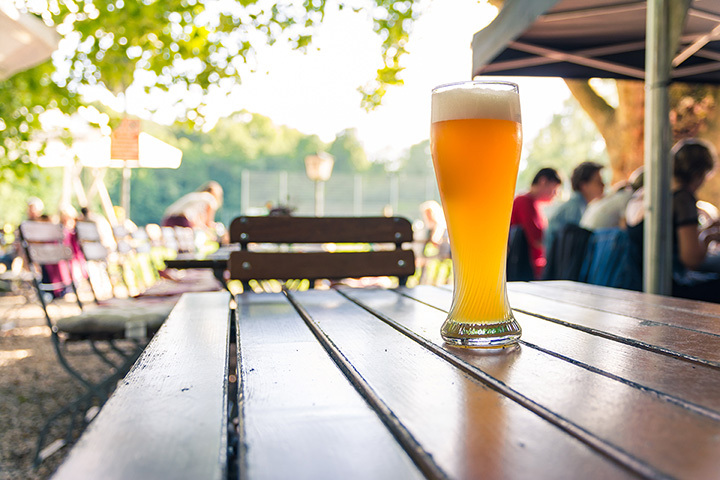 Check out the following beer gardens in Maine. You’ll likely come away with a new favorite brew. The beer garden at the Black Birch is quiet and comfortable. Enjoy one of their beers on tap and a sample from their farm to table menu, and you’ve found your new favorite place in Southern Maine. For a place not “trying to be a bier garten,” Nova Res Bier Café has a great beer garden. The family establishment encourages bringing the kids while parents enjoy a beer. This patio area is filled with regulars and tourists. You’re sure to strike up a great conversation, even if you go alone. The cozy atmosphere of Nocturnem’s beer garden in addition to their excellent selection of brews makes this place a must-visit in Bangor. Beers on tap are rotated frequently. Customers love the selection, and they say the food is well worth the visit, too. If ever a beer garden was the perfect setting for enjoying Maine, New Castle Publick House is the place. In subtle contrast to the stately brick building, the beer garden is quaint and cozy. Dine on oysters, brie, and other indulgences while enjoying your favorite brew. Featuring the finest microbrew and domestic beers on tap, The Quarry Tap Room is dubbed “a modern day saloon.” The beer garden, with its views of the Kennebec River, is rustic. It is frequented as long as the weather permits by those who deem themselves true Mainers. Even though the beer garden at the Maine Beer Café overlooks at parking lot, the food and the beer make up for that unfortunate situation. The staff makes games available for families and adults who are kids at heart. The tap list is lengthy and the flatbreads are to die for. Enjoy one of countless beers and ales in the beer garden at the Great Lost Bear. Fill up on Portland’s Best Chili or a hearty salad. It might be difficult to find parking, but even if you have to walk a few blocks, you’ll be glad you did. Does it get much cooler than a beer garden tucked away in the woods of Maine? Funky Bow not only has great brews, but offers live music, hosts weddings and parties, and even has “Growler Nights” every Friday and Saturday which is a must-experience party. This beloved Bar Harbor hangout offers awesome wood-fired pizza, craft beers, and plenty of fun. The casual vibe creates a welcoming environment and their patio bar is a great place to hangout when the weather is nice.